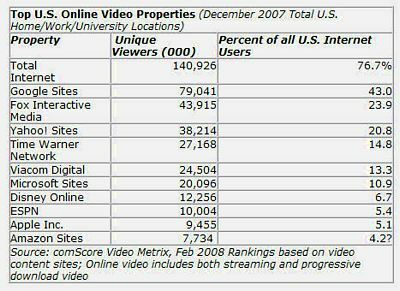 More than 140 million Americans watched 10 billion online videos in December says a report from comscore Video Metrix. That’s about 72 videos per viewer. Video Metrix said the average video was 2.8 minutes. Over the course of a month the average viewer spent three hours and twenty minutes enjoying this new habit that didn’t exist even three years ago. Google sites had 43 percent of this new attention-getter, followed by Fox (23.9 percent) and Yahoo sites (20.8 percent). Lord only knows what Americans are snacking on, however, because comScore Video Metrix didn’t say. This entry was posted in Advertising, Attention Economy, Media trends on February 26, 2008 by Tom Abate.